Are you a steak lover? Then Restaurant Argentino Luna is the place for you to visit! Many say that they have the best Argentinian steak in town! If you find it hard to decide between rib-eye, sirloin or rump steak, the friendly staff is more than happy to help you with your decision. 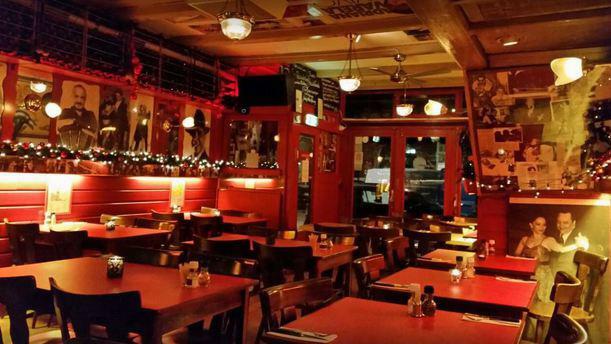 The restaurant is located in the middle of the Jordaan, a lively area in Amsterdam, which makes it a great location to start your night out. If you want real meat this is the place to go. Nice staff and real place for the perfect piece of meat. I was impressed by the quality of the meat and how nice they were. Lovely peaceful spot. Cosy and homely environment. Great touches with welcome bread with olives, dipping oil and chimichurri dip. Attentive staff and, of course, wonderful steak! Excellent food and good value in a lovely part of town. Great place - attentive service - good food and wine. Be sure to visit! Fantastic in all it ways, there was some space issues as of being a small local place. But what it was missing in space we gained in service and food quality! Awesome steak. great service. Would definitely recommend! A great restaurant. This was my second visit as I went last year- amazing service, friendly and delicious food- we had the steak and they catered for gluten free! I’ll definitely be recommending! Wonderful people! Great service! Nice music! Yummy! Delucious food, good wine, friendly service. Very good value for the money. That was one good steak. Amazing!!!! Fav Argentinian in Amsterdam! We had an amazing night with Steak and lamb chops on point, live music and really good service. Highly recommend!